Editor's note: Today we have an exciting “preview” to share with you. 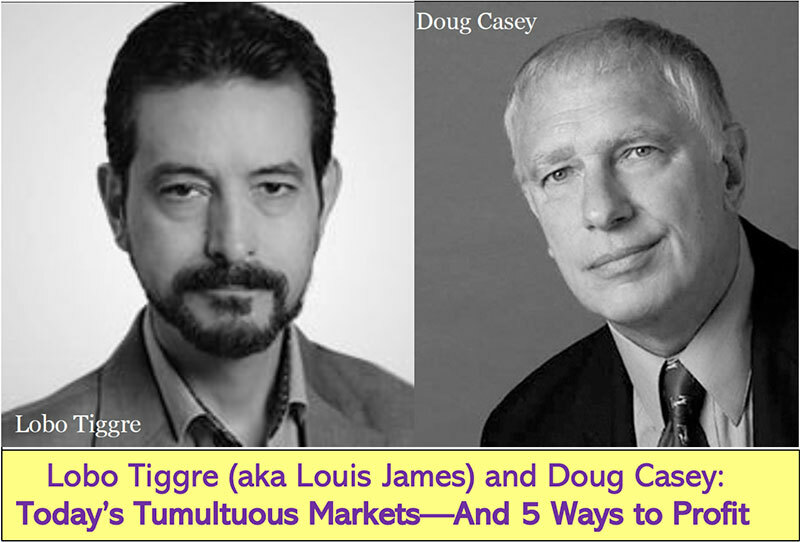 If you've been reading the International Man Communiqué, you probably know Casey Research founder and New York Times bestselling author Doug Casey just published a brand-new novel. What I’m hoping to do with a series of novels I’ve been writing, is to offer people a vastly different way of looking at reality itself, and a vastly different way of deciding what’s right and what’s wrong. Like everybody else, I suppose, I’d like to change the world and I’d like to change it for the better. As we speak, the world is going in the wrong direction in many ways. Technologically, it’s advancing at an incredible rate, which is very good, but from an ethical point of view, it’s going downhill. I would like to help reverse that ethical decline. So I worked on a series of six books that reform the reputations of six highly politically incorrect occupations. The first of these is Speculator. Charles Knight, the hero of all six novels, shows that you can be a good guy—a moral guy—even if you engage in these occupations that nobody likes. He starts at age 23, learning to be a speculator, and he turns very little into $200 million. It’s a page-turning adventure story, about a young guy who discovers a mining fraud in Africa, climaxing in a revolutionary bush war. But it’s also a morality tale—which is what, for instance, makes Casablanca many people’s favorite movie. In the next book, Drug Lord, which will be out by this time next year, we go into how the legal and illegal drug businesses work. How these drugs are made, how you make money from them, the morality of marketing them; perhaps it’s not as obvious as one might think. I promise that our readers who pick up Speculator on Amazon will be glad they did… I’d love to get your take on the book. And comments about how our hero, Charles Knight, should evolve in coming books. Speculator is a riveting tale that follows protagonist Charles Knight, a 23-year-old man who goes on a thrilling mining adventure and ends up risking it all in a far corner of the Earth. Speculator has already received high praise around the industry. It’s very rare in literature to have, at the same time, a captivating story and a potent serving of sound philosophy and free-market principles. Speculator does it better than anything I have ever seen. It could introduce you to a new way to look at life. I expect Speculator will be a timeless classic. 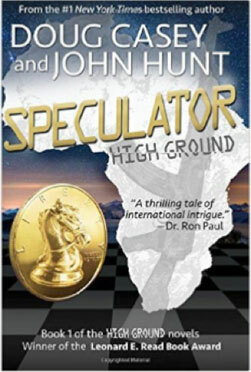 If you thought Atlas Shrugged was good, Speculator will blow you away. As someone who deeply believes in personal and economic freedom, I can’t wait to see what Charles does next. We want you to see why for yourself. So we're giving you a “sneak peek.” We hope you enjoy… and have a wonderful holiday. Charles Knight stood tall at the edge of a precipice. Far below, the tumultuous Bangu River scoured its path along an ancient fault while its roar echoed up the canyon walls it had carved over the eons. He gazed over hundreds of square miles of thick African bush. The decades-old geologic surveys conveyed none of the continent’s colors, its fragrance, the weight of its air. To the north stood steep hills capped with erosion-resistant dark-green basaltic rock—the congealed blood of extinct volcanoes. To the west, a ghostly band of gray clouds, pregnant with rain, floated at the horizon. When the rain arrived, it would come in torrents, the likes of which few people on the planet ever experienced. The ledge on which Charles now stood had suffered the assault of such rain for millennia. Little remained of the limestone glue that had, for all that time, maintained the integrity of the rock. The additional stress of his 180 pounds simply proved too great. With a sound no louder than a sigh, the once solid rock transformed into fluid under his feet. He felt it happen. He knew what it implied. Gravity, its will defied too long, would wait no more. He reached for anything solid and found nothing. Sadness at lost opportunities weighed upon him more than fear. His twenty-three years of life would end as an irregular stain on the jagged brecciated rock two hundred feet below, a stain that would appear only after agonizing bounces off outcrops that would mangle his body on the way down. There was nothing Charles Knight could do but die. And the nearest person who would give a damn was 5,000 miles away. His Uncle Maurice asked him this with the air of a wealthy man who knew the workings of the world. They were the first words that Uncle Maurice had ever said to him beyond a brusque grunt that served as an initial greeting. Charles had just turned thirteen, and it was both his first trip back East and the first time he had met his uncle, his mother’s mysterious—and reputedly dangerous—brother. The boy sat in the great man’s luxury apartment among a bewildering assortment of financial newspapers and corporate reports, surrounded by walls sheathed with books. He’d been assigned one of the spare bedrooms and given to understand he could stay until the end of summer, or until he wanted to go back to Montana. Or until Uncle Maurice asked him to leave. Whichever came first. Uncle Maurice was an intimidating man. He had a big head that Charles knew was filled with brains and packed with knowledge. And a formidable body that, though bursting with fat, was full of heart. Or so his mother used to say. Charles shifted to sit upright on the couch, pushing aside some scattered debris of his uncle’s unkempt lifestyle. After a moment’s hesitation he looked at his uncle and replied simply, although his voice cracked with a combination of tension and the hormonal changes of adolescence. Uncle Maurice raised the eyebrows on his expansive forehead and pursed his lips between prodigious cheeks. His expression changed from one of brief surprise to one of interest, now studying his nephew with closer attention. He then followed his first question with a challenge. Because he was still in school—a situation that would not persist much longer—Charles was accustomed to teachers assigning mind-numbing fluff to no useful end other than to occupy his time. But his own uncle assigning him homework just wasn’t fair. It was summer vacation. His mother had died three weeks ago. 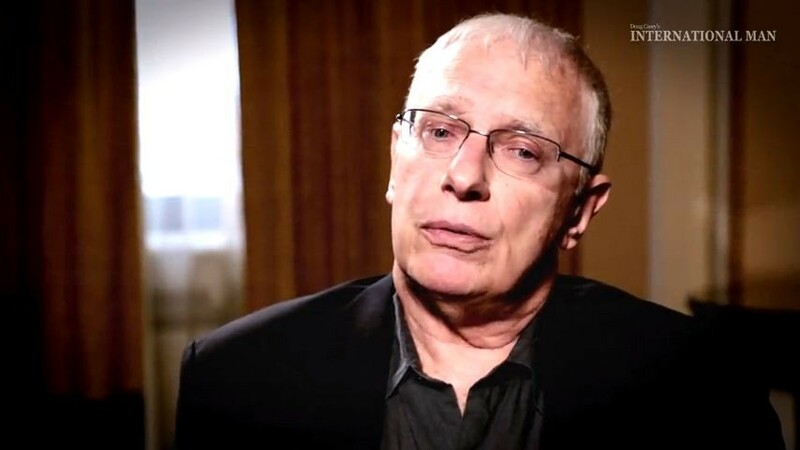 He hadn’t come to New York to write an essay for this man. He came here because his father—consumed in grief—thought the time apart would be good for both of them. “When is it due?” Charles asked, with just a touch of ill-concealed distaste. Based on his school assignments, he presumed a deadline for filling several pages with conventional thoughts in order to please a teacher who was herself just going through the motions. Exploring the city from the top of the Empire State Building to the tunnels in the subway system had a lot more appeal than writing a paper. As did visiting the Natural History museum and studying the exhibits at his own pace without the distraction of other students. Or climbing into the torch of Lady Liberty—whether or not it was legal. What adventure would he have to sacrifice to write a pointless essay? This assignment would at the very least cause him to defer reading The Count of Monte Cristo, which he had squeezed into his travel backpack that morning before he boarded the plane. But it turned out Uncle Maurice was nothing like those teachers. He was more like a co-conspirator. During the rest of the day—and the rest of his life—Charles Knight’s mind returned to this exchange. Perhaps it was because memories are profoundly imprinted during times of emotional stress. Maybe it was because this was the first connection with a man who loved his mother too, and who ached along with Charles. It wasn’t long before this spark from his uncle had ignited into a driving quest to explore what might constitute a life that was good. And adventurous. And exotic. And more. What, indeed, was the meaning of life? An amazing new technology could make a lot of investors quite rich. Microsoft, CNN, Google, Facebook, Wal-Mart, and even the U.S. Post Office are either using it already, or planning to. Click here to learn how you could capture a 1,152% gain in just 2 years. As featured in TechCrunch & Fast Company… this award-winning luxury curated gift set makes the perfect holiday present for the hard-to-shop-for son, father, or husband in your life. Hurry and get yours for 30% OFF before they sell out. Uncle Maurice had issued that assignment ten years ago, almost to the day. Charles Knight chanced one look down, past his sweat-soaked shirt, past his muddy pants, and past the tips of his boots that were unable to find purchase on the unstable, near-vertical rock face to which his hands desperately clung. Boulders that looked like teeth littered the canyon base far below. He was attached to the cliff by little more than friction. He would have a few seconds to contemplate his life while he fell to his death. The rush of the river’s water overwhelmed all sound other than the throb of blood surging through his head. He slipped further, abrading his chin and the tip of his nose. Grit from the rock crunched between his clamped teeth. He found a dangling vine, grabbed it, and strained with ferocious intent to postpone his demise. But neither his arm nor the vine could suspend him for long. His father had advised him against this trip, just as he had advised a skinny and ambitious twelve-year-old Charles not to build a tree house in the high branches of the backyard oak. The consequences of that endeavor included the scar near his elbow, glistening white in the bright sunlight against his dark tan. That lanky teen had grown into an athletic young man with a permanent glint in his determined yet playful blue eyes. And his uncle’s challenge a decade ago had turned into a mission of ever-greater personal interest. He always assumed he’d have time to complete it. Now, however, confronted by a plunge into a literal abyss, he regretted that his quest would go unresolved. Life really was short. His eyes scanned the weathered limestone conglomerate, its quartz crystals and mica shards burrowing under his nails as he clawed with his free left hand. He glanced up at the remains of the ledge. Through a conspiracy of fate, physics, and recent rains, the outcrop had collapsed just as he completed collecting the rock samples that now inconveniently weighed down the pockets of his cargo pants. These rock samples represented the gold-bearing formation that had drawn him to this country. The subsurface structure lay exposed here, revealing the mineral composition of the whole area. No expensive drilling equipment was needed to gather the rock. Instead, he had impetuously risked his life for it. Two minutes ago it had seemed like a good idea. He had twenty feet to climb, if he could move at all. But as he struggled, the vine that tried to save him released its hold on the tree far above. An unexpected serenity enveloped him as his free fall began. Maybe the overdose of adrenalin relaxed him. Perhaps he should not have tried this particular career path, he thought. A single root of the vine, the only one that had managed to infiltrate the subsurface rocks, proved just strong enough to jerk him to a wrenching stop. He dangled in the open air. There was nothing to swing to, nothing to push off of. His forearms cramped. Okay, now came the fear. He let out a yell from his diaphragm to the cosmos at large. “Hold on!” He meant to encourage the root of the vine, or his hands, or nature as a whole. The yell increased his strength and courage. But his voice just echoed back at him from the shadows of the cliff four feet in front of his nose. The vine bled through its cracking bark. It was just as near death as he was. His mind flashed to the trivial nature of his existence. He wondered if he’d feel it when he hit the rocks below. It’s said that people feel little pain when mauled by bears or tigers. Perhaps his end would be the same? It made no sense to exit his existence immersed in fear and panic. Those base biologic responses were simply too degrading to consume the rest of his life, all twenty seconds of it. At least his life would conclude with an adventure in an exotic place. But had he led a good life, to the very end? He thought Uncle Maurice should have the chance to learn. Perhaps the cosmos agreed, because just then a thick rope fell from what could only have been the heavens. It slapped against the rock ledge above and dangled to his left. Charles’s bloody fingers grabbed at the man-made miracle. He transferred his weight to the damp rope just as the vine sheared through, his left hand burning along the harsh manila. After securing his grip, he released the broken vine from his other hand and, with a passing appreciation, watched it undulate down to strike onto the sharp rocks below. Then he adjusted his grip, wrapped his ankles around the rope, and shinnied to the top of the cliff. Charles looked up as wiry arms reached under his shoulders and dragged him from the edge of death and onto horizontal ground. The rock samples in his pockets dug into his thighs. He rolled over on his back and stared at the sky, exhaling a loud sigh of relief, fatigue, and gratefulness. His body broke into a cold sweat despite the humid heat of the jungle. The frail-looking man wore small spectacles balanced low on his nose so that he peered over the top of them. A broad-brimmed boonie hat sat low on his ears, with long strands of grey hair emerging from under it. A soft grin formed on his weathered face and in eyes as blue as Charles’s own. This stooped-over, gimpy-legged, and seemingly beaten-down old Dutchman was named Xander Winn. Charles had steered clear of the man earlier on the tour for reasons he could not quite understand. Something about Winn just didn’t add up. Winn pointed over to where the rope was tied to a Caterpillar amidst miscellaneous machine parts, spares, and other mining equipment. “If you wanted to explore the canyon, the rope was right in that pile of gear. It would have been wiser than pretending you’re Tarzan.” He chuckled. Charles’s heart raced, his arms ached, his chest pounded, and sweat soaked his clothes. He was covered with abrasions and bruises and blood. A minute ago he had almost died. And this man joked about it. You had to respect that. Maybe Winn was okay after all. Charles luxuriated in the heavy air, its feeling on his skin, and the overwhelming joy of living another day. He could continue on Uncle Maurice’s quest. He would remember to treasure each minute of life, for a miracle had happened, in the form of a hunched-over Dutchman and a rope. Editor's note: Charles' adventure is just getting started. As he continues on his journey, he'll unearth deception, violence, romance… and much more as he tries to seal his investment in the greatest gold discovery ever. To find out what happens next, make sure to purchase your copy of Speculator right here.